(Boston, MA) Brown Box Theatre presents Boxer Shorts: From Water to Dust (Del gua al polvo) in collaboration with Icaro Compania Teatral. It’s a short evening, say 50 minutes to an hour, of work from playwrights we don’t see a lot of in Boston: Jose Rivera, Nilo Cruz, Maria Irene Fornes, and Caridad Svich. From science fiction to abstract drama, It’s a nice change of pace. While not 100% reflective of the work by these playwrights, it’s an introduction to their work. It’s enough to give the audience motive to seek out more. The evening opens with “Tape” by Jose Rivera. This daydream of a science fictiony silver nugget asks, what if we’re still responsible for our life choices after death? 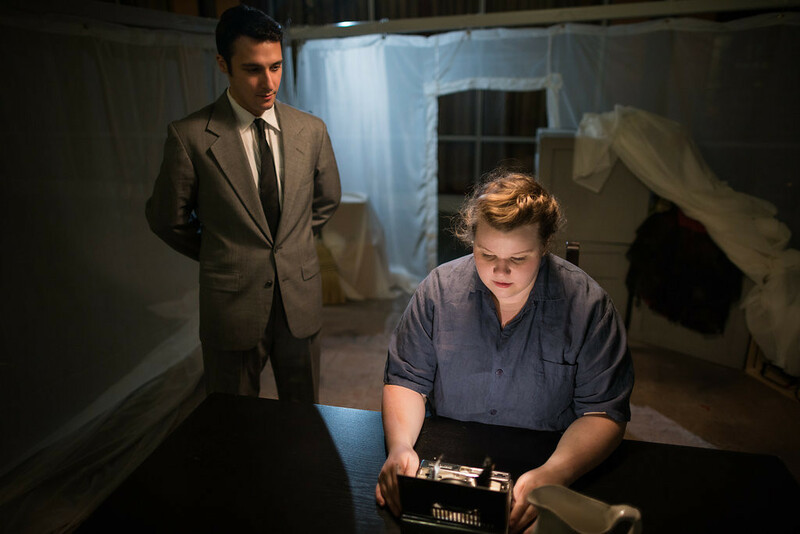 In a haunting scene played by Rachel Belleman and Johnny Quinones, Rivera posits that even the most innocuous of missteps can lead to discomfort in the afterlife. Belleman and Quinones give strong performances in a tiny space that reach beyond the enclosure in which they are bound. The best play of the evening was “Capricho” by Nilo Cruz. It was exceedingly well acted by Miguel Septien who spun the audience through a merry dance of anxiety and euphoria. In it, Lolo, an actor, goes through the motions of preparing for a performance. He performs the manic rituals that fellow performers will recognize as nervous ticks and superstitious charms. Taustin’s direction, Septien’s performance and Cruz’s writing balance seamlessly. Septien evokes great sympathy from his audience even as his staging forces a discomforted physical reaction from us. It’s a fun dichotomy that is true to life even if the symbolism is metaphysical in nature. Combined with the eerie light cues and purposefully muffled sound cues, “Capricho” is decisively effective in its delivery. “Springtime” by Maria Irene Fornes is a stubby play that starts a little gay and ends with heartbreak. It’s not exemplary of Fornes’ best work. It has her style, sure, but its short scenes and abstract concepts don’t do it any favors. No matter how great a job the actors do, and they were fine, it’s not going to make up for Fornes’ stunted scenes. “Bliss” by Caridad Svich is notable for being the most physically demanding play of the evening and the best directed. Curtain establishes immediately through movement the plight of her actors and the world in which Svich is working. Without giving anything away, it is evocative of the lovers Francesca and Paolo in Canto V of Dante’s Inferno. Rainbow (Olivia Caputo) and Jim (Quinones) flit about the stage just as Dante’s lovers are tossed recklessly around Hell. The writing itself is odd but Curtain’s work with it is impressive for such a short piece. There are pluses and minuses to Boxer Shorts. It’s an evening of good theatre created from unique plays with a strong cast. P.S. It’s also free. If you see it for no other reason, see it because it’s affordable for everyone and all theatre deserves an attentive, full audience. 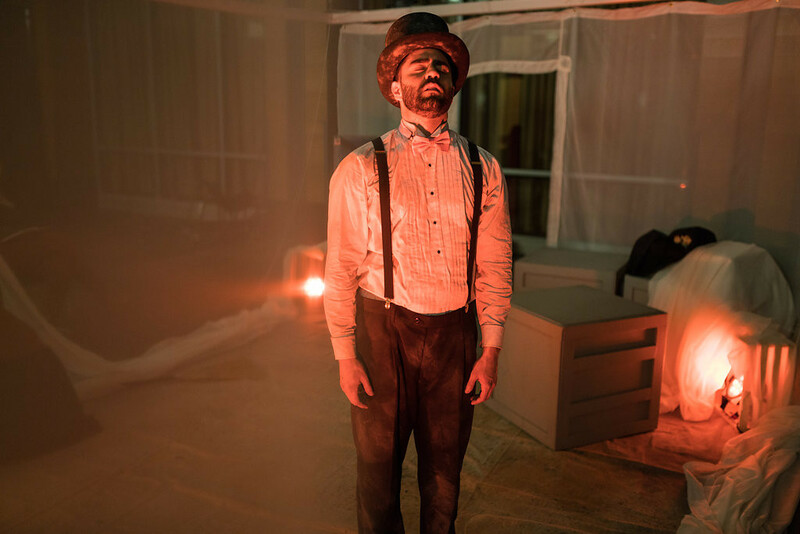 This entry was posted in Drama and tagged 2016, Boston, Brown Box Theatre Project, Caridad Svich, Dante's Inferno, Del Agua al Polvo, February, From Water to Dust, Icaro Compania Teatral, Johnny Quinones, José Rivera, Kitty Drexel, Kyler Taustin, March, Maria Irene Fornes, Maryland, Miguel Septien, Nilo Cruz, Olivia Caputo, Rachel Belleman, Talia Curtain by Kitty Drexel. Bookmark the permalink.